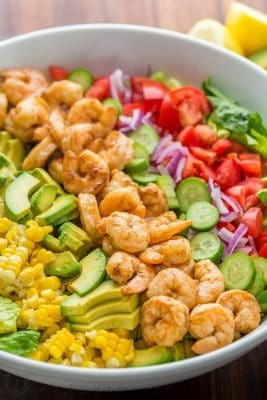 Avocado Shrimp Salad Recipe with cajun shrimp and the best flavors of summer. The cilantro lemon dressing gives this shrimp salad incredible fresh flavor! Pat dry shrimp with paper towels and place in a medium bowl. Add 1 tsp cajun spice, 2 pressed garlic cloves, a pinch of salt and stir to combine. Place a large non-stick pan over medium-high heat. Add 2 Tbsp butter and once its melted and hot, add shrimp in a single layer. Sauté 2 minutes per side or just until cooked through. Transfer to a plate and set aside. Chop, rinse and spin dry 1 medium head of romaine lettuce. You should end up with about 6 cups lettuce. Transfer that to a large mixing bowl. Now add 3 sliced tomatoes, thinly sliced red onion, sliced cucumbers, 2 sliced avocados and 1 cup cooked corn. To make the dressing, start with 3 Tbsp of fresh lemon juice, now finely chop about 1/2 cup of cilantro and stir that in. Add 3 Tbsp of olive oil and extra virgin has the best flavor. Season with 1 tsp salt and a generous pinch of black pepper and stir that together.